Ah, work. We know how I am feeling about that topic. Let's move on. I prepped dinner yesterday so it could be heated up quickly so it was one less thing to worry about. Below was so freakin fast and the kids LOVED it. The recipe is from Gooseberry Patch's cookbook "Farmhouse Kitchen" - I am obsessed with Gooseberry Patch! I used freshly grated Parmesan cheese for the dinner and noticed I was running low on it. Get It Done Tip: Whenever I am about about to run low on something I automatically add it to my notes list on my mobile device -- I have a weekly grocery list, a Costco list, a Walmart list, a Target list, etc. so I add it in as appropriate to ensure I don't forget. If my brother read this blog maybe he wouldn't have run out of toilet paper at his daughter's birthday party this past weekend. I am not sure how we're related. Getting fancy with our pictures - action shot + sepia! 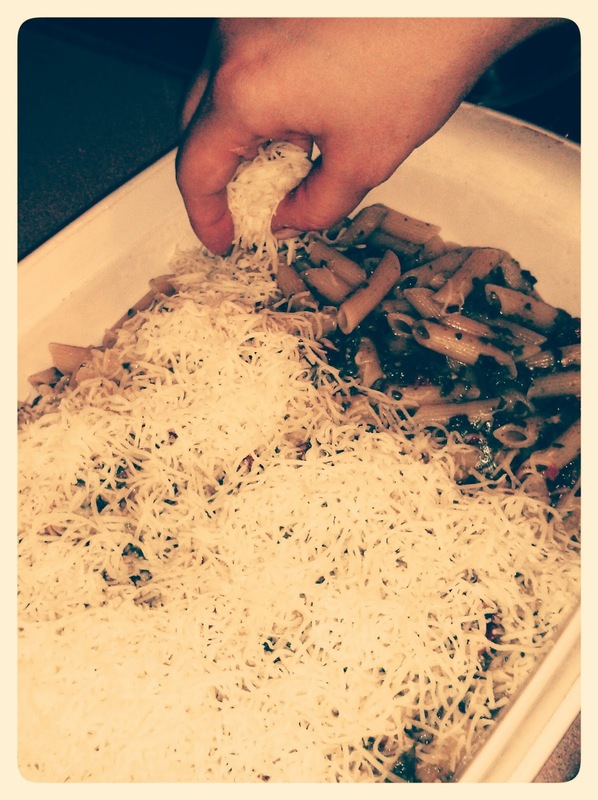 Mix all ingredients except mozzarella cheese; spread in greased 13x9 baking pan. Cover and bake at 350 for 30 minutes, until hot and bubbly. All three of my kids devoured it. My husband is yet again on a anti-carb kick and had a green smoothie and I went out to dinner with an old colleague and ate homemade pasta!